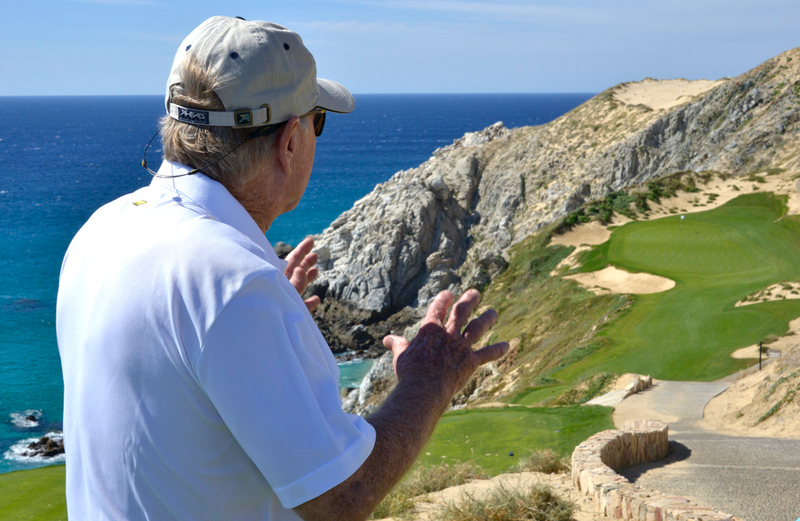 Jack Nicklaus—already the king of golf in Los Cabos, Mexico—has raised the bar on the Baja with his new Quivira Golf Club. The Golden Bear was on-hand for the layout’s grand opening Dec. 4. It marked his sixth design in the top golf destination of Los Cabos and Nicklaus Design’s 25th overall design in Mexico. The 7,139-yard course takes golfers on a vision quest of unparalleled beauty, utilizing the mountain-desert-ocean ecosystem that characterizes the region in its picturesque design. The opening drew a large group of national, U.S. and international media, as well as VIPs who included the Governor of Baja Sur, the Mexico Secretary of Tourism, and former PGA Tour standout Esteban Toledo. Adding to the excitement surrounding the grand opening of this buzz-worthy track is the recognition it has already received. Golf Magazine selected Quivira as its Best New International Course, and the stunning layout is a finalist for Golf Inc.‘s Development of the Year Award. Quivira’s first four holes ease players into the round, before the lengthy cart ride up the rocky mountain reveals the cliff-hanging par-4 fifth hole, and a pair of stunning oceanfront par 3s, the sixth and 13th holes. The latter clings to granite cliffs on the Pacific. One of the most spectacular one-shotters Nicklaus has ever designed, the sixth hole is angled into the prevailing wind. The tee shot must find and hold a long narrow green that drops off to a cavernous bunker and oblivion on the left. The difficult, 310-yard fifth hole that comes before it, which Nicklaus tweaked with some last-minute changes during a Dec. 4 tour, will intimidate some off the tee due its mountainous terrain; however, golfers will find the hole is actually very playable. Holes 5, 6 and 13 will provide perfect lookouts to watch migrating whales during winter months, while four other holes wander through towering sand dunes—the same dunes that once served as the backdrop for the movie Troy. Several semi-blind shots through the dunes—off the tee at the uphill par-4 11th and the second shot on the twisting downhill par-5 12th—might be disconcerting to first-timers. The round climaxes with three elevated tee shots on daunting par 4s through the more traditional desert landscape. The 18th green, thatch-roofed clubhouse, and driving range all run along the beach. Quivira Golf Club is accessible to guests of the four Pueblo Bonito Oceanfront Resorts and Spas in Los Cabos, and to owners of properties in Copala, Montecristo Estates Luxury Villas, and Novaispania Residences. Each of the Pueblo Bonito Resorts welcomes guests with lavish accommodations, unsurpassed service, fine dining and a host of on-site amenities. Complimentary shuttle service to and from Quivira Golf Club is included within the Quivira development. For reservations or further information access the web site at quiviragolfclub.com or call 1-800-990-8250 to customize a visit.